Guess who celebrated their 5th birthday last weekend? 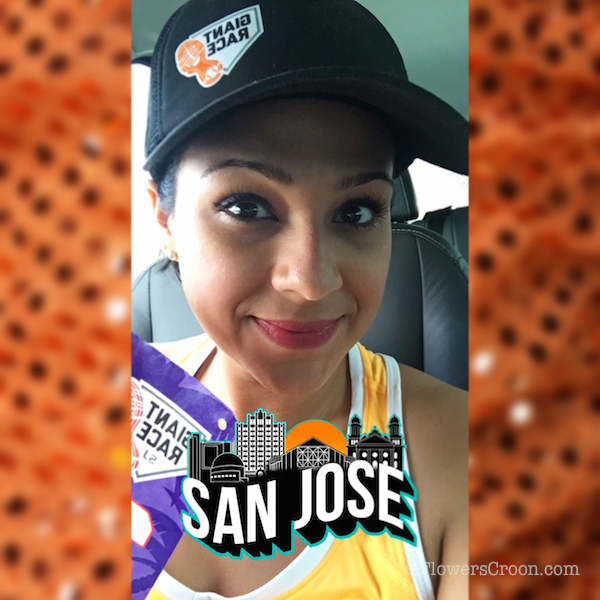 The San Jose Giant Race! I've been running this race since the inaugural back in 2012. It is without a doubt my favorite local 5K. If you have never run a 5K or 5 mile race but have always wanted to try, I recommend this as your first race of either distance because it's flat, fast, fun and hello - GIANTS! I arrived at bib pick-up a little earlier than necessary because I actually thought the race time was earlier. I blame the San Jose Sharks for getting my brain all jumbled up. There was plenty of parking available for anyone and everyone, so I grabbed my bib and headed back to my car to get ready, stretch, relax, eat and take an obligatory pre-race photo. The kind where you still look nice because no sweat has happened yet. I met up with friends at the start line and chatted about running and racing in the Bay Area. We talked about things runners talk about: prices, bib pick-up times, prices (again) and quality of races. We all agreed that there are some races we are willing to pay more for because of the experience. For me personally, I'd rather pay more for a local race that supports my community and keep running it year after year rather than repeat running the same $200+ half marathons that don't support my community. That being said, I really support the Giant Race organization and their efforts to support the communities all over the Bay Area with food and opportunities for kids to play ball. As soon as the race started I took off running at a relatively moderate pace but after 4 minutes I needed my inhaler - which was in my car. With my headphones. WOMP. I decided to take it easy and not chase a PR. With a slow and steady pace I finished and happily entered the field where I received my rad anniversary medal and tech tee. I visited the booths on the field and picked up a new "run local" hat (YES!) and took photos and shopped at the San Jose Giants dugout store. I bypassed the World Series trophy line because I still had to make stops to check in on my parents and daughter, so I cut the fun short and hopped into my car to spend the rest of the day with my family. Another San Jose Giants 5K in the books and what can I say besides, I love this race! The course is a fun out and back that winds through the shaded area of Kelley Park just when you need it. We even weave through History San Jose Park which I overheard one runner refer to as, "hey, it's kinda like Disneyland". I thought that was funny! If you missed the San Jose Giant Race but really want to earn Giants bling don't fret - the SF Giant Race happens on September 11th in San Francisco. You can still register! I'll see you there at the 10K!